Incorporates full receive and transmit paths with on-chip synthesisers and VCOs. SIERRA Monolithics, represented in Australia by Glyn , has released a dual-band transceiver that enables low-cost customer premise equipment (CPE) for broadband wireless access (BWA) applications. It has been designed to support WiMAX-compliant products. The SMI7035 is a dual-band transceiver incorporating full receive and transmit paths with on-chip synthesisers and VCOs. It tunes over 2.3GHz to 2.7GHz and 3.3GHz to 3.8GHz. The 3.3GHz to 3.8GHz transmitter offers 55dB of gain control range and greater than 35dB error vector magnitude (EVM). 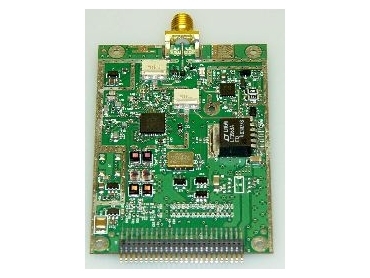 The receiver has an input range of -100dBm to -20dBm and is designed to operate in an interference-limited environment. The on-chip synthesizer has about 1° rms and a settling time of less than 80μs. The single IC with wide tuning range allows original equipment manufacturers (OEMs) to address the wide variety of different frequencies being used worldwide with a single part. This lowers inventory costs for OEMs while reducing the cost of the RF section of the radio. Sierra Monolithics also has evaluation kits available. The kits provide a complete RF section at 3.5GHz suitable for half-duplex frequency division duplex (FDD) or time division duplex (TDD) operation. Schematics and assembly information are provided. This evaluation kit is compatible with the Intel PRO/Wireless 5116 broadband interface, the first IEEE 802.16-2004 system-on-chip optimised for cost-effective WiMAX modems and residential gateways. The SMI7035 dual-band transceiver and development kit provide a low-cost, high-performance RF solution that is ETSI-mask-compliant and supports 64 QAM performance. This will enable OEMs to rapidly adopt WiMAX technology.